Tetradic signs have been an inspiration for monumental use from ancient times. Rudimentary renderings, chiseled in stone or other material, are known from prehistoric times. The actual relation of these signs with a tetradic mind will always remain a mystery, but the conclusion that the makers were able the grasp a quadripartition is the very least to assume. The qualification of the artists as backwards has to be reconsidered and defined with more care: anybody who can divide a space in four parts cannot be called ‘primitive’. It is rather the opposite: a four-fold mind, not hindered by a particular identification or expression of the Self, is a very mature mind, which passes the simplifications of oppositional thinking. The creative Paleolithic Man of Lascaux (France), existing some fifteen thousand years before our time, not only painted animals and humans on the walls of their caves, but also a wide variety of geometric signs. The simple ones were made up of dots or in a linear fashion, but sometimes they were extended into elaborate drawings of quadrangles, triangles, circles, pentagons and branched chains. The quadrangular signs are comparable with those found in Gabillou (Dordogne). The ancient habitats of early Neolithic man at Çatal Hüyük (Turkey) are of a considerable younger age (6000 BC). They were studied and described by MELLAART (1967). 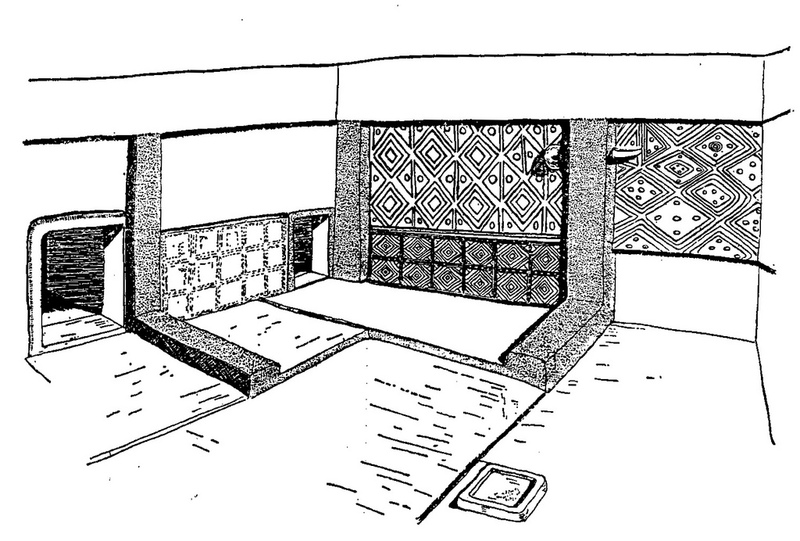 The walls of the various rooms and ‘shrines’ were decorated with textiles of a ‘kilim-like structure’. The reconstructed walls of a shrine, as given by James Mellaart, are shown in fig. 485. Fig. 485 – This reconstruction represents the north and east walls of a shrine at Çatal Hüyük (Turkey). The decorations of the wall paintings have the form of lozenges and rhombus. The association of these paintings with patterns on textiles (kilims), as stated by James Mellaart, is scientifically debated and found untenable. A controversy broke out after the publication – in a private edition by Johnny Eskenazi, a rug dealer from Milan – of Mellaart’s book ‘The Goddess from Anatolia’ (1989). A great number (forty-four) of ‘sketched reconstructions’ appeared, which were not backed by photographs or other evidence. They tried to prove the importance of a Mother Goddess. The direct relation between the textiles (paintings) on the walls in Çatal Hüyük and modern kilims (patterns) was further stretched. The scientific community was convinced that the ‘disclosures’ were a hoax, both on the ground of discrepancies with the original excavation reports and on specific technicalities of weaving. ‘I was stunned by overwhelming stylistic incongruities between Mellaart’s new ‘reconstructed’ paintings and the obviously genuine wall paintings appearing in photos in the 1960s Çatal Hüyük excavation reports’ (MALLETT; 1990/1993). Figure 486 gives a reproduction of the latter, ‘genuine’ wall painting, which was accompanied by a photograph in Mellaart’s earlier book. It shows four superimposed phases of painting: a triangular ‘kilim pattern’, quatrefoils, finer quatrefoils and step patterns. 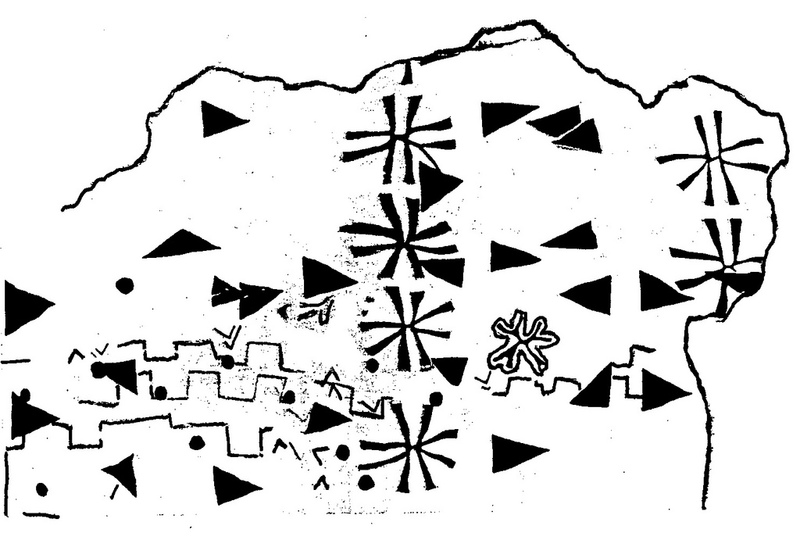 These decorations indicate, regardless of the scientific bickering, that Neolithic people used a graphic language with quadripartite elements. It could be inferred from these observations that early human beings possessed the ability to think in higher division environments. Fig. 486 – An illustration of four layers of geometric signs on the wall of a shrine (A.III.8) in Çatal Hüyük (Turkey). The first layer shows an unfinished kilim pattern with triangles. The second layer displays rows of quatrefoils (star patterns). The third layer consists of finer quatrefoils, while the fourth layer has a step pattern. The separation of each set of motifs by a layer of white plaster showed a continuation in time. The use of the cross as a decoration tool was well established in the Greek Geometrical Style period, which started in the ninth century BC (see fig. 74). Apparently, the use of geometrical patterns was so important that this part of the Archaic Period derived its very name from these features. The various types of circles, crosses, squares and angular adornments, which decorate the vases and other pottery – but were also present at temple walls (fig. 487) – are a firm reminder that the spirit of the four-fold division was alive in those formative times. Fig. 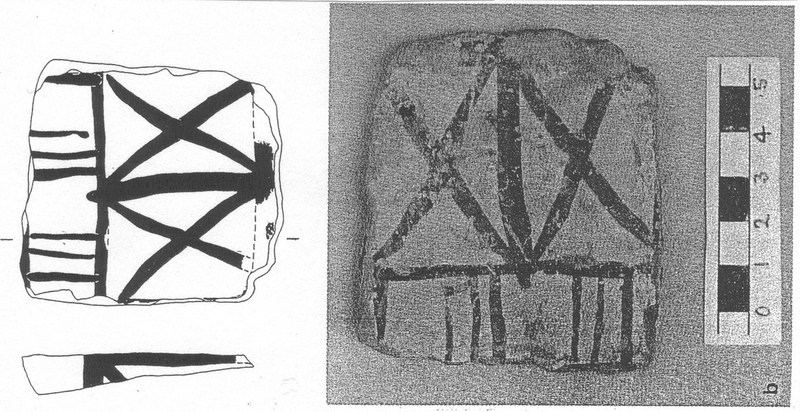 487 – Some fragments from an Archaic Temple dedicated to Artemis Orthia in Sparta show a distinct cross pattern (CATLING, 1994). It has been stated earlier that the four-fold was not a dominant factor in the Golden Age of Pericles (480 – 430 BC). An exception is the Temple of Athena Nike at the Acropolis of Athens (see p. 120, fig. 84), which was built between 427 and 410 BC. The building can be regarded as an early hallmark of ‘tetradic’ architecture with its four columns on both sides of the cella. This type of architecture surfaced later on a larger scale in the Ionian, tetrastyle temples of the eastern part of the Greek territory. Most of those Prostyle type temples (in Pergamon, Priene and Magnesia) were constructed in the third and second century BC. Therefore, they are situated on the CF-timescale towards the end of the Greek independent cultural presence. The latter was established at 146 BC when the Romans conquered Greece. Of a much younger age is the wide variety of tetradic signs related to the Christian faith, which ‘took off’ in the fourth century AD. In particular the symbolism of the Holy Cross is widely used as a source of inspiration in architectural and monumental art. The symbolism of the cross is, in essence, a deeply human experience of the four-division. The original message of Christianity – as a faith devoted to peace and brotherhood – does fit smoothly into the general meaning of four-fold thinking, saying that the ramifications have a non-hierarchical nature. Christianity had to compete – in the early period of its existence and still within the Roman Empire – with the Iranian inspired Mithras belief. The tension between a four-fold setting (the original Christian message in the realm of a Roman Empire in its ‘Fourth Quadrant’) and the dualistic background of Mithraism took on historical proportions in the first centuries of the Christian era. The downfall of the Roman Empire implied the fading out of Mithraism, which was, essentially, a ‘soldier’s religion’. The survival of Christianity was partly due to the failing of the concurrence, but also had to do with its acceptance in the ‘Dark Ages’ of Europe. The problem of Christianity has always been the difficulty of bringing her message across in a peaceful way. History has learned that the sword is a much more effective way to subdue people. The Romans proved this earlier and the Arabs (and the Islam) did the same some centuries later. The modern variant of bringing ‘democracy’ (to the Middle East) by weapons discloses that the principles of power politics are still in force. The wry, but often inescapable, truth learns that the winner always seems right and writes history its own way thereafter. A characteristic sign (like the cross) can become a pressing issue in any peaceful ‘struggle for survival’. The Christian Church rapidly annexed the meaning of the cross as a representation of ‘wholeness’ when the association with the cross as an instrument for capital punishment had worn off. The sign of the cross found its first, ‘recycled’, meaning in the catacombs of Rome, but the renewed interpretation found a quick response all over (Celtic) Europe. RICHARDSON & SCARRY (1990) noted that ‘a number of the ideas behind the setting up of the High Crosses in Ireland go back ultimately to the time of Constantine the Great (323 AD)’. The cross was used from that period onwards principally as a sign of triumph and indicated the victory of Christ and the Christian faith. KERNMODE (1907) gave an example of the gradual development from the Chi-Rho monogram into a cross (fig. 488). Fig. 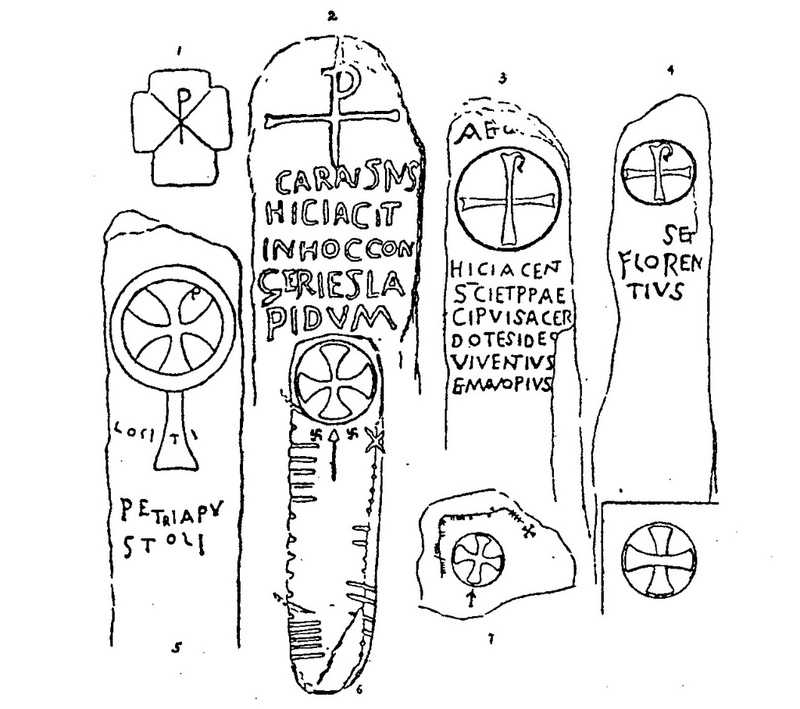 488 – The development of the cross from the Chi-Rho monogram as observed on the monuments of the British Isles in the fourth century AD and thereafter. 1. S. Just; 2. Penmacho; 3,4. Kirkmadrine; 5. Whithorne; 6. Aglish; 7. Maumenorig; 8. Modern Dedication Cross, S. Olave’s Church, Ramsey, 1860 (KERMODE, 1907). The High Crosses ‘were erected in the precincts of monasteries where they had a protective significance and probably served as points of assembly for religious ceremonies’ (RICHARDSON & SCARRY, 1990). They carried, in that capacity, the tradition of the standing stones and stones circles into the realm of (Celtic) Christianity. The imaginary of the prehistoric artifacts – and its distinct sense of direction – continued in the setting of the medieval Christian monuments. A diagram in an eighth century, Irish ‘pocket’ gospel book known as the Book of Mulling, shows the position and designation of the Holy Crosses around a monastery with a circular enclosure. The association of geometric signs with funerary art was earlier discussed (in Chapter 3.7) in relation to graves, tombs and mausoleums. The emphasis in that chapter was directed towards manifestations of the circular (I) and octagonal (IV). This approach is related to the visibilities of the First and Fourth Quadrant (see fig. 242). The signs of the cross (II) and the square (III) provide their own vantage points associated with respectively the Second and Third Quadrant. In particular the sign of the cross (II) covers a large field of meanings and intentions. This is not surprising because this quadrant harbors the world of primal ideas and features all types of interpretations. The religious meaning of the cross goes back to the ancient Church and is recorded in the writings of early ecclesiastical leaders like Tertullian (second century AD) and St Basil (fourth century). The sign of the cross was administered in baptism and prayer, and was a reference to the death of Christ at the cross. The meaning as a universal four-division of space moved to the back-ground when the sign was used for promotional reasons. Fig. 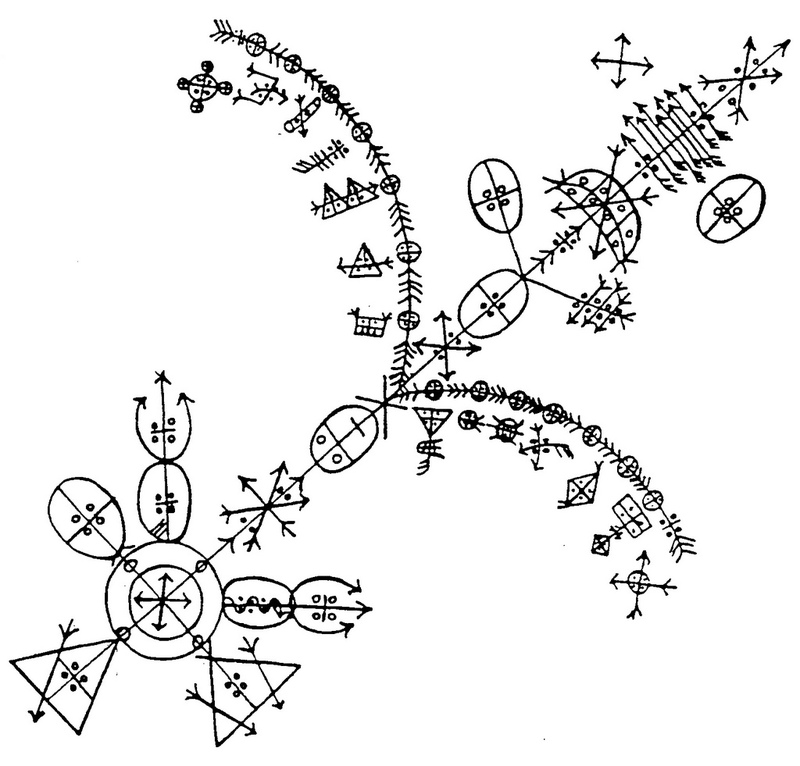 489 – The death of many generations is depicted here as a line with extensions to the four directions of the winds and running through the zodiacal signs. The arrows point to death and departure, but also to a next stage of living. The field of (funerary) crosses and their application is sheer endless. Figure 489 gives an illustration of the use of geometric forms in relation to the afterlife as presented in the Afro-Caribbean realm. In every cemetery all over the world – at least within a Christian connotation – is a reminder of the sign in its many stylistic forms. Any particular choice of illustration would give no credit to the variety of the historic representations of the cross. The reference to the four-fold division of space seems to be concentrated at the boundaries of the visible visibility area (X) of a human life, starting with the event of birth (baptism) and ending with death (funerary practices). The position of geometric images in a communication should be kept in mind whenever the circle, cross, square or octagonal appear on the architectural scene. The genetic history (of a form) starts as a signal in the neutrality of the First Quadrant. It becomes a sign when it enters the realm of the Second Quadrant. The institutionalized value is established in the Third Quadrant, when the shape is attached to a tangible reality. In the Fourth Quadrant is a much wider understanding of its presence in an eternal communication. ‘Understanding’ the circle means in this latter setting the intellectual insight in the universe of the First Quadrant, which does not have a beginning or an end because of its circularity. The use of the cross, as a crossing of two lines, calls attention to the basic four division of space, which can be imagined in the Second Quadrant. The square, consisting of two pairs of parallel lines, limits the space in the Third Quadrant to its measurable proportions. And, finally, the octagonal/polygonal opens vistas to a new multiplicity in the Fourth Quadrant, which will end – in an asymptotic way – in the circle again and a (new) First Quadrant. This same framework applies for the ‘quadralectic’ signs. The cross, which is a Second Quadrant sign par excellence, can figure in a Third Quadrant setting as a meeting point of a duality (two lines) or in the Fourth Quadrant as the marker for the extended world of the four-fold. Even its presence in the First Quadrant is imaginable, when the sign of the cross has religious undertones, pointing to a possible position of the invisible invisibility of God. In other words, a quadralectic thinker can see the cross from different angles at the same time, ranging from pure geometry to sacred or political interpretation. The understanding of quadralectic architecture is based on a postulate of four types of visibilities. Observation comes to us, on the one hand, in the simplified version of dual pairs (invisible invisibility, invisible visibility, etc.). The visibility can also be expressed, on the other hand, in an exact number (the CF-value), which can be calculated when two points of recognition (POR) are chosen by an observer. This framework is a human invention, like all ideas – let there be no doubt about that. No scientific proof for the existence of a quadrant, nor for its specific type of visibility can be found. Invisibility is just as hard to proof (or measure) as visibility. However, the shift (motion) of a particular type of partitioning of space (division) results in a distance, which can be measured. This hypothesis of distance is the foundation of a newly defined quadralectic visibility and comes to life when the observer uses this knowledge in the ensuing communication. Tetradic signals (in architecture) could be the messengers of a hidden world of the four-division, but they might just as well be the emblematic expressions of lower division thinking, pushing certain numerological ideas to their limits. Only the notion of the observer in terms of its own position in a historic-ongoing (quadralectic) communication can solve these problems of meaning and judge the tetradic world in its right setting.